Belle Epoque by Elizabeth Ross. Delacorte., 2013. Currently Available. Face Value: It’s pretty and dreamy, just like the setting of the book. It has the feel of a historical painting. The rumpled sheets and bodice askew make it feel a tad bit like a romance novel, though. The vulnerability of the cover model’s pose is in stark contrast to the strong wills of the female characters we meet throughout the book. Does it break the slate? Smashed, shattered, busted. This book examines notions of beauty at a time when wealth and artifice reigned supreme. Ross developed male and female characters that show the best and worst of beauty. Belle Epoque deftly examines the relative values of external and internal beauty, as well as the concept that beauty is in the eye of the beholder. Readers are challenged to think about how beauty evolves and changes along with society. It’s terrifically thought provoking. Who would we give it to? Historical fiction lovers are bound to fall head-over-heels for this book. The details of the era are carefully researched and lusciously described. Review: While reading Belle Epoque, something occurred to me that should have already been totally obvious: setting is important. The Diviners by Libba Bray is captivating not only because it has a fascinating cast of characters, but also because it is set during a time when occultism fascinated the wealthy and intellectual. How Zoe Made Her Dreams (Mostly) Come True wouldn’t have the same charm if it wasn’t set in a quirky, slightly maniacal theme park. The same is true for Belle Epoque. Paris in the late 1800s had just been through serious upheaval, and was easing into a time of increased creativity and innovation. The wealthy classes, shaken by the social change happening around them, clung to everything beautiful and extravagant as a reminder of their place in the hierarchy. Meanwhile, the Eiffel tower was under construction. Many in Paris saw this tower as a hideous imposition on the skyline and hoped that it would be torn down after the World’s Fair. It’s jarring to think of this iconic structure, which is now synonymous with Paris, as something that people wanted to get rid of. This juxtaposition of setting with theme is what makes Belle Epoque so effective as a story. As the characters watch the construction of the Eiffel tower and ponder its relative beauty in contrast with the city, they consider their own value and inner beauty. The book features Maude Pichon at the heart of the story. Maude runs away from her rural Breton village to escape a life of monotony and an arranged marriage. She heads to Paris, where she believes she can immerse herself in the beauty and luxury of European wealth. The reality of Paris, however, is much different. Maude struggles to keep a job. She can barely afford basic needs, much less little luxuries. Unwittingly, Maude answers a job advertisement for a repoussoir agency. Their business is hiring out plain or ugly women to be “beauty foils” to the wealthy. The idea is that they make their companions stand out as more gorgeous in comparison. Business is booming. Maude reluctantly becomes a repoussoir, even though it means she takes a daily beating to her self-esteem. Maude is “rented out” to be the client of a duchess who wants Maude as her daughter Isabelle’s constant companion. Maude is supposed to be at Isabelle’s side, emphasizing her beauty and convincing her to enter into a beneficial marriage with a wealthy suitor. The whole time, Isabelle is completely unaware that Maude has been hired for this job. As Maude begins to befriend Isabelle, the situation becomes tense. She learns that Isabelle has no interest in marriage. Instead, Isabelle is an intellectual, curious about pursuing the sciences and studying at the Sorbonne. Maude admires Isabelle’s curiosity and goals, yet she has to encourage a marriage in order to complete the job she was hired to do. Ross does a marvelous job of crafting Slatebreaking female characters. Both Maude and Isabelle have to weight their priorities – is it more important to have a secure lifestyle in which you feel constantly demeaned, or to pursue your goals with the risk of uncertainty? They muster the confidence to face the people and institutions that most challenge them. I found it inspiring to read the scenes in which these women faced tension. It made me think about my own ideals and whether I’m doing the right things to pursue them. 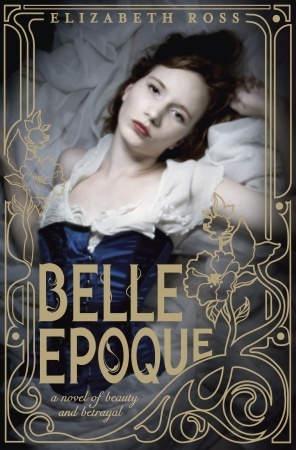 Belle Epoque is such a refreshing and needed addition to the YA canon. Like The List by Siobhan Vivian, it explores social status and beauty with nuance that young readers absolutely must experience, especially in our appearance-centric popular culture. What makes Belle Epoque so unique is its historical perspective. It shows us that struggles with appearance have long been part of a young woman’s experience and reinforces the idea that we have to dig deeper to find meaning in ourselves. Reviewed from a digital copy purchased at http://www.amazon.com. This entry was posted in Reviews, Young Adult and tagged appearance, beauty, Eiffel tower, Historical Fiction, Paris. Bookmark the permalink.